Dharo Aatham is Coming on 23 Saptember 2012. Dharo Atham is a unique ritual observed in Gujarat during the waxing phase of moon (Shukla Paksha) in Badarvo or Bhadrapad month. Dharo Atham 2012 date is September 23. It is observed on the eighth day of Shukla Paksha. Mothers observe Dharo Atham for the wellbeing and long life of their daughters and sons. Dharo Atham ritual consists of worshipping of ‘dharo’, green grass, and listening to the story associated with the ritual. 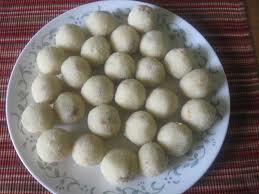 Married women and mothers eat only once in the evening of the eight day of waxing phase of Bhadrapad month. The food eaten on the day is cooked on the previous day. Take a Tava & pour ghee on sim flame. Add flour & mix it till flour become reddish brown in colour. Remove the mixture from the gas & cool it for few seconds. Take an empty thali & spread some ghee on the thali. Pour all the mixture & spread it evenly. Leave the spreaded mixture to cool for some time. Then cut the mixture of your favourite shape. Roast rice to a golden colour. Grind and to a powder. Add grated jaggery and coconut. Make balls of this mixture.